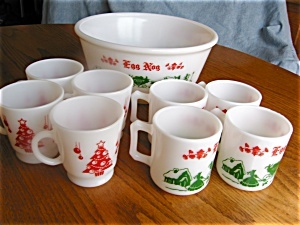 Retro Hazel Atlas eggnog set. Very attractive glass eggnog set with the Hazel Atlas logo on bottom of bowl and glasses. Four of the glasses match the bowl, and you get 4 additonal glasses for free, (different holiday scene on them, but are all Hazel Atlas; 8 glasses in all!). No chips or cracks; bowl is 9 wide x 4.5 tall; matching glasses are 3 tall x 2.75 tall; other glasses are 3.25 tall x 3 wide. Very nice to serve your holiday guests a glass of eggnog in!